This beautiful room was pulled together by one of my clients after a Walk & Talk Consultation. The styling here really helps buyers visualize themselves enjoying “movie night” in the comfort of their own new home! Media rooms are an especially attractive asset to high-end real estate buyers who expect luxury features in a home. Just like any other room, staging a media room well means creating a space that helps potential buyers dream about what life could be like in your home! 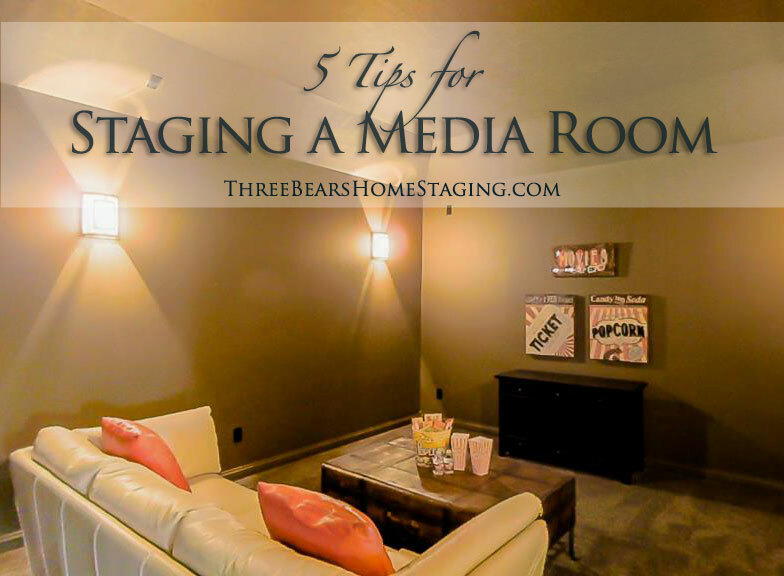 Use these tips to show buyers your media room is the perfect place to hang out and relax! Neutralize paint. I tend to see an unusually high percentage of red media rooms in my consultations. Remember, the goal for staging is to create mass appeal in order to attract a greater number of buyers. While a thoroughly red media room works beautifully for many home owners, such a strong design statement will likely limit its appeal to potential buyers. Softer, more neutral tones promote relaxation and better allow a buyer to envision the space as their home instead of being reminded it’s still yours. Use vignettes. Vignettes are little groupings of props or decorations that create an emotional connection point for your buyers. They romanticize your home! If there’s a wet bar, set out a tray with a couple of empty stem glasses and a wine bottle. Setting a coffee table with (fake) popcorn and soda invites potential buyers to picture themselves relaxing in the home with a great movie! Hang oversized artwork. This is a great trick for media rooms that are devoid of electronics. Hang a large art piece in place of the screen for a touch of color on that giant blank wall. In the Houston area, local artist Stephen Scott creates large scale custom framed art and photography to complement your decor. Visit his site at http://artreka.com. Invite relaxation with plush seating. Add lots of pillows and a coordinating throw to create a comfortable space where buyers dream of unwinding. Hint: If you’re missing your red paint, throw pillows are a great way to add some pops of color back in to the room–and you can take them to your new house! Maximize lighting. Buyers respond best to “light and bright.” Media rooms, however, are typically dark and often windowless. Add a floor lamp, open windows, and turn on all lights during showings so that buyers can see all that this room has to offer. 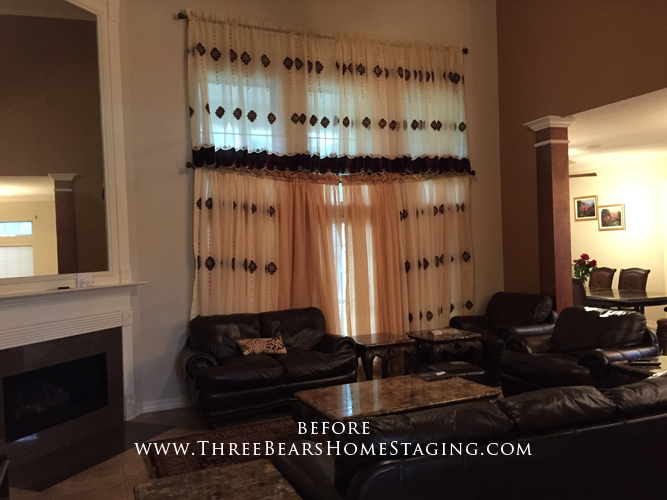 If you still need a little help getting your media room just right, call Three Bears Home Staging & Redesign at (832)377-0785 to schedule a consultation. We’ll help you get your media room ready for show time in no time! Home staging is about creating a love connection between the property and potential buyers. As the home seller, you have a HUGE advantage: a perfectly targeted, captive audience and an opportunity to make multiple good impressions! Most buyers who come to your house are good prospects. They are actively shopping for the product you are selling, and if they’ve made it inside your front door, your house probably already meets their general criteria. Each room gives you, the seller, the perfect opportunity to make dozens of first impressions. It’s critical that those first impressions are good ones! Most buyers have trouble seeing past overdone, older, mismatched decor, unusual smells, dirty carpets, and strong paint colors. If the property isn’t in move-in ready condition, they will go down the street and purchase a similar house that is. Before staging, this high-end home was dark, cave-like and uninviting. Buyers won’t linger long in an environment like this. Conversely, a home that is open, updated, inviting, that looks and smells fresh and cared for subconsciously invites buyers to visualize themselves living in it! This is why home staging is critical! By removing clutter, depersonalizing, creating warmth and cohesion — in short, staging the home — you have the power to move the buyer from looking at your house to evaluating whether it could be their home. Remember — buyers visit a home for logical reasons (it’s in the right neighborhood, it has enough bedrooms and bathrooms, it’s close to work). But they make OFFERS based on EMOTION! A certified professional home stager from Three Bears Home Staging can help you create a love connection for your property! 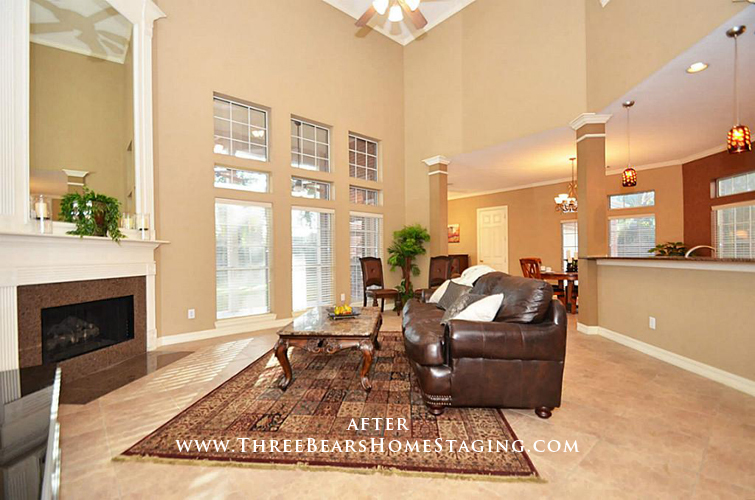 Give us a call at (832) 377-0785 to schedule a home staging assessment today! What people actually do and what they dream of doing are often two very different things. For example, not all buyers entertain lots of company… BUT they all ENVISION a lifestyle of entertaining. Interesting, isn’t it? Home staging is 100% visual merchandising. It is about creating spaces that bring the vision to life — spaces your buyer demographic can dream of or “aspire to.” By staging your home, you help buyers transition from the logical decision to visit your home (because it fits their size/location criteria) to the emotional decision to make an offer (because they can “see” their family living in that home)! The below chart helps you creatively view the differences between the “vision” staging creates for buyers who walk through your home and the way we typically live! Hands On Exercise – Grab one of your favorite home magazines or catalogs and flip through the pages. You will see that every photo is “visually merchandised” to create a longing in the viewer. We want to create that same merchandising vision in every room of your home! Need help creating that vision? 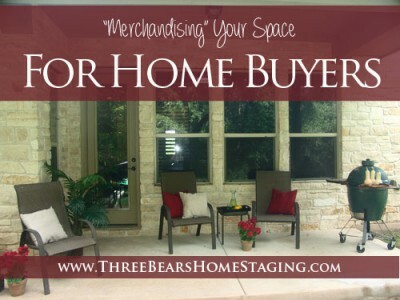 Three Bears Home Staging & Redesign can help! Give us a call at (832) 377-0785, or fill out our contact form today!